Vocal : Kyoko Fujii Singer, song-writer. Graduated from Berklee College of Music in Boston. She is an active studio-vocalist and her works could be heard in various TV-CM, CDs and so forth. Guitar : Yoichiro Kojima Born in 1949, Nagoya. Learned under Masayuki Takayanagi and Toru Konishi and became a freelance-jazz-guitarist in Tokyo. He once stopped his music career but started again when he moved into Karuizawa in 2010. 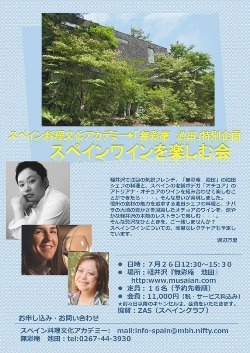 He wishes to support establishing jazz-culture in Karuizawa through sending out the true sounds of real instruments. He played in the first “Karuizawa Art & Jazz Festival” in June 2014 and is scheduled to be in the next festival coming up on July 2015 as a player and also as a member of its executive committee. Piano : Ryonosuke Hirama Born in Tokyo. Moved into Karuizawa in 2011. He composes for TV-CM and movie-soundtracks, sound-produces albums, offers songs for various artists and also plays at recordings and lives. As a unit “tangerine.” he released CD-series of “FLAVOR BOSSA CASE” which earned No.1 in a weekly ranking of world section at Shibuya-HMV. He just started playing Jazz only a year ago and is now so much enjoying of entering to a new world. Bass : Satoshi Okabe He returned to his homeland Shinshu when 311 occurred in 2011. He used to be known as an aggressive rock-climber but is now temporarily pausing its activity since then. All of a sudden in 2013 he decided to become a bassist and already appeared in the first “Karuizawa Art & Jazz Festival” June 2014. From the end of that year he started to play regularly at “wine & music Rubato” as a member of KJC and is now enjoying his music life. An unique bassist, a part-time instructor at Wako University in Tokyo and also a member of Kanto Rocky-area Institute. Drums : KAZ Sasada With over ten years experience of band-playing with a guitarist Kazumasa Akiyama and Yoshikazu Suoh, he moved into Karuizawa in 1998. He appeared on “Kita-Karuizawa Jazz Festival” 2009 and 2010, “Monzen Jazz Festival in Nagano-city sponsored by SBC” 2012 and 2013, NHK-Nagano’s TV program “Hirutoku” with a vocalist Michiyo Horiuchi as a member of NSS in May 2013. He was also in the first “Karuizawa Art & Jazz Festival” in June 2014 and is scheduled to be in the next festival coming up on July 2015 as a player and also as a member of an executive committee. 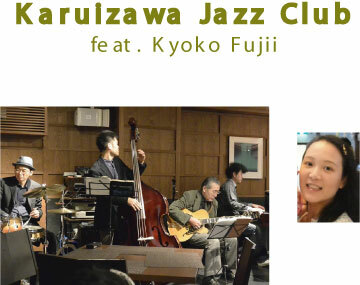 He regularly plays at “wine & music Rubato” as a member of NSS and KJC, and is always hoping for the expansion of Jazz-scene in Karuizawa.